I wasn’t there when you were massacred. The struggles, the fears, the pains you went through were all beyond what I could imagine. Hell-like or far worse than hell. You probably only thought about, at least, not dying because your families were waiting for your coming home. Even on the verge of death, you were probably having visions of your aging parents, your nagging beautiful wife, your most loved fiancee, your cheerful daughter and son. Only if you knew your lives were to be taken away that instant, you wished you could have done this and that, but noone told you, noone could. You ended up in that bloodbath. You fought for your lives, for the people, for your country, but were killed, mercilessly. And even after death, you were inflicted brutality, robbed, and were mocked at. And, I – who don’t know everything, who’s among those who only get information from what’s being fed through news and broadcasts – mourn, and pray for justice you more than deserve. 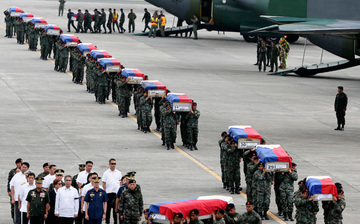 Millions of us, the living Filipinos, deeply sympathize to your families for losing fathers, husbands and sons. Millions of us argue on who’s to be blamed. Each of us chose our truths and let go of our clamours. Sadly, others could still say gruesome news as this shouldn’t be talked about because they give off bad vibes. That we’re not even related to those dead to a certain degree so this issue shouldn’t concern us. That talking about the issue couldn’t change anything, couldn’t bring those dead back, couldn’t be of any help. I think otherwise. Talking, clamouring, commenting and arguing may seem powerless, but it is through voicing out where more people hear and learn about your story. And those people who heard and learned will start talking about your ill-fate. And the more people talk about you, may it be the truth, the half-truth or just a made-up truth, the more those in power will pay attention to your story. Only then will serving you justice become, at the very least, possible. Because the moment people start to talk less about you, your story will start to get buried, and eventually, forgotten. That’s the usual in our kind of justice system, even with the most sensitive and heavy cases like yours. I wish I can do something to honor further your heroism, to lead your sacrifices to the masses’ awareness. I wish more voices will join and shout for your truth and justice. Your deaths must not become deaths in vain, brave souls.